Fortunately, I’ve narrowed it down to the best four events you’ll want to attend this month. They’re all on the weekend, so you’ll have enough time to make your trek. Whether it’s raising money to combat childhood hunger, celebrating Fatherhood the best way possible, eating the best tacos in the city or carousing the famous Rose Bowl for the best bites in Los Angeles, June is shaping up to be an exciting time to be in L.A. Let’s get started. Now in its 25th year, Taste of the Nation Los Angeles is one of the top charitable food events I’ve got going on all year. If you’ve have the money to splurge, go for the VIP ticket as you’ll have access to Danny Bowien (Mission Chinese Food, Mission Burger), whose cooking is presently available only in San Francisco and New York. The general admission line-up is solid, including Evan Funke (Bucato), Susan Feniger (STREET), Antonia Lofaso (Black Market Liquor Bar), Vartan Abgaryan (Cliff’s Edge), Neal Fraser (BLD), Mette Williams (Culina), Ray Garcia (FIG), Wonny Lee & Yoya Takahashi (Hamasaku), Jason Travi (Littlefork), Ricardo Zarate (Picca, Mo-Chica, Paiche), Kris Yenbamroong (Night + Market), David LeFevre (M.B. Post, Fishing With Dynamite), Sang Yoon (Lukshon), Roy Choi (Sunny Spot), Jason Neroni (Superba Snack Bar), Josh Whighman (The Bazaar), Kris Morningstar (Ray’s + Stark Bar), Valerie Gordon (Valerie Confections) and more. The cause and the line-up are really all you need to know – besides the drink sponsors, that is. Livigni + Moix, St. George Spirits, Eagle Rock Brewery, The Bruery, Handsome Coffee and Intelligentsia will answer to that. Tickets cost $160 for VIP admission and $110 for GA. At the door, they go up $50 and $25, respectively. All of this is for the benefit of your appetite and fighting childhood hunger via Share Our Strength. I’ll see you Sunday. Josh Lurie, FoodGPS, is at it again. This time, it’s in celebration of Father’s Day with Firestone Walker Brewery, and local chefs, brewers and coffee roasters are coming together in Downtown L.A. for a brunch extravaganza that you won’t likely see again. Brewers have teamed up with a coffee roaster to come up with a coffee-flavored beer. Chefs will be plating specialties from their respective, well-regarded restaurants. You don’t have to be a father to see that this is an occasion worth coming out for. A portion of the ticket proceeds is donated to Share Our Strength and for the drivers, there’s iced tea. Seating is communal and costs $50 per person, or $60 at the door, if still available. Get your tickets soon! This is LA Weekly’s inaugural Tacolandia, featuring hand-picked vendors by the one and only Bill Esparza, the city’s resident taco expert. Join him for an afternoon at the Hollywood Palladium for not only tacos, but music, a tequila garden and more. Confirmed participants include Laurent Quenioux of Bistro LQ, SOL Mexican Cocina, Westside’s Guerilla Tacos, Loteria Grill, Mexicali Taco Co., Rocio’s Mole De Los Dioses, SoHo taco and La Guerrerense, making for a super delicious, daring line-up for your ultimate taco pleasure. Tickets are only $20 for GA and $40 VIP, the latter of which includes tacos and hosted bar. A portion of these proceeds will benefit Homeboy Industries, a great program which works for the reintegration of the formerly gang-involved into society. 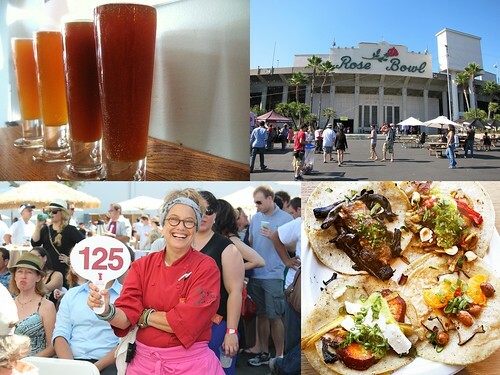 Towards the end of the month, we’ve got the 4th annual LA Street Food Fest at the legendary Rose Bowl in Pasadena. Go for the widest range of eclectic bites at a tasting event this year, with the vendor count toppling 100. Taste of Mexico restaurants such as Guelaguetza, Yuca’s, Ceviche Project, El Coraloense and more will be on-hand, as will pop-up vendors such as Dante Fried Chicken and Starry Kitchen, plus food trucks such as Luckdish Curry and the Grilled Cheese Truck. Restaurants like Short Order and Lazy Ox Canteen will be providing bites, too. And it wouldn’t be complete without cocktails by Pablo Moix and Steve Livigni, 1886 and Julian Cox and Josh Goldman. A Singha beer garden and an ice cream social (that is, dessert area) are the icing on the cake. All of the aforementioned is included in your $50 GA ticket, with the $75 VIP enabling you to enter two hours early. Total tickets cap out at 5,000 for maximum food portioning efficiency. I’ll see you at these assorted June events around the city! Bring your bib! This entry was posted in beer, charity, Culver City, Downtown LA, Events, Food, Food truck, Hollywood, Music, Pasadena and tagged Beachwood BBQ, beer, Bill Esparza, Caffe Luxxe, chefs, Cismontane Brewing Company, coffee, David LeFevre, Eagle Rock Brewery, Evan Funke, events, Firestone Walker, Food GPS, Golden Road Brewing, Hamasaku, Handsome Coffee Roasters, Homeboy Industries, Intelligentsia, Jason Neroni, Jason Travi, Josh Whighman, Kris Morningstar, Kris Yenbamroong, LA Weekly, Ladyface Ale Companie, Lamill coffee, Portola Coffee Lab, Ray Garcia, Ricardo Zarate, Rose Bowl, Roy Choi, Sang Yoon, Share Our Strength, street food, Susan Feniger, taco trucks, tacos, Taste of the Nation LA, Tierra Mia Coffee, Valerie Confections, Valerie Gordon, Vartan Abgaryan. Bookmark the permalink.